What’s it called when workers deposit their hard-earned cash into their modest bank accounts only to find out that a politician has grabbed an armful of the money and handed it over to failing banks? We call it theft. 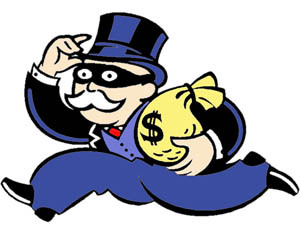 The big banks are the thieves, their politicians willing accomplices. A fairy-tale? Hardly — it’s actually come to this! European front. Big banks are failing as the economic breakdown sweeps across Europe. On the Mediterranean island of Cyprus the government is accommodating a big bailout scheme concocted by the European Central Bank (ECB) and the International Monetary Fund (IMF). Joblessness is epidemic, social welfare programs are on the chopping block everywhere. In Cyprus they went even farther, announcing that banks could help themselves to 6.7 percent from every deposit account! Cypriots went viral on line and in the streets, and the state backed off. But banks are still limiting withdrawals to 300 euros ($393), and more bankster tricks are sure to come. In short, savings and checking accounts are being robbed to keep failing banks alive. It’s a very scary precedent. Greece’s bank woes preceded those of nearby Cyprus. The ECB and IMF have imperiously demanded ruthless austerity. The capitalist Greek government is holding what amounts to a yard sale to raise bailout funds. One of the government’s more unpopular moves is selling off the state-owned Hellenic Railways Organization, which manages most of Greece’s rail infrastructure. Hellenic Railways is a public institution. Since its primary purpose is transportation, not profit, it connects towns whose lines may lose money. Now this public transit system is being privatized to bailout banks. This conversion of collective wealth into private property is outright theft. Heists in the US. Americans are discovering that bank robberies are brewing here too. Most believe that their checking and savings and other deposit accounts are safe because the Federal Deposit Insurance Corporation (FDIC) says so. But that is changing. Under a deal being worked out by the FDIC and the Bank of England, banks in both countries will have the right to give you stock in the company instead of your money when you make a withdrawal. “Bank equity” will pop out from the ATM, not dollar bills. Oh goody! You’ll be part owner of a failing bank. And that’s not the only thievery in store for U.S. workers. Massive cuts in vital social services are taking place in Europe. They call it “austerity” there. They’re sneakier here. It’s called “sequestration.” And its stated aim is to “reduce the national debt,” that is, pay off the banks. Obama broke his own campaign promise not to cut Social Security when he signed the sequestration bill in March. Now he’s telling people he has saved Social Security from the cuts. Not true. There will be lots of cuts. For example, instead of following the usual cost-of-living-allowance (COLA), Social Security payments will be based on a “chained” Consumer Price Index (CPI). No longer matching the rising cost of, say, asparagus, the COLA allowance will now match a cheaper item “chained” to asparagus, like peas. The purchasing power of Social Security checks will shrink as a result. And the President has pretended that the Department of Defense (DOD) will share equally in sequestration. This is also a lie. The Pentagon budget will increase over the next decade, but at a lower rate. Slashing retirement accounts and healthcare and education and food programs, while growing bank bailouts and military spending, is more stealing from workers to enrich the already rich. That is Mr. Obama’s program. Take back the wealth! The Greeks and Cypriots overwhelmingly oppose the thefts just as most Americans want no cuts in Social Security and Medicare. Yet it’s the allegedly progressive leaders who are navigating the heists — the Greek Socialist Party (PASOK), Cyprus’s Communist Party (AKEL), and the U.S. Democratic Party. Obviously, workers worldwide need political parties that represent their interests. Ruling class propaganda is in full gear. They say that Greek and Cypriot workers’ “make too much money and retire too soon.” White House and congressional suits say that “Social Security and Medicare and Medicaid damage the economy.” Lies. The working class did not create the economic implosion. Financial speculation, obscene profiteering and multitrillion-dollar warfare did. The capitalist class is desperately trying to resuscitate itself by privatizing everything under its control. We need to nationalize banks and other mega businesses under workers’control. It is, after all, a simple matter of taking back the wealth created by us in the first place. Click here to see the current Freedom Socialist. Special offers during the June-September FS $100,000 Fund Drive: send $7 for one year (save $3) or $10 for two years (save $10) to Freedom Socialist, 5018 Rainier Ave. S., Seattle, WA 98118. To subscribe to the FS by postal mail, email, or audio CD, visit here. To see the booklist at Red Letter Press or to find out more about the Freedom Socialist Party, go towww.socialism.com, or reply to this message. We would love to hear from you! Keeping you up to date on the FSP.